The governor of Stirling suggested that the English bypass the Scots, rather than attacking head-on. This sounded like a good idea, so a division of English knights under Sir Robert Clifford crossed the river higher up. Randolph and de Bruce were watching the battlefield when they noticed the division moving to Stirling. Randolph’s division was at the tail of the column, so if the English passed it, they could enter Stirling Castle without any more hindrance. After a rebuke from Bruce, Randolph flew to join his schiltron, which had barred the knights from coming any closer to the castle. It was a hard fight. The English knights tried to break through the spears, but could not. The Scots stood their ground, and the English were beginning to break. Sir James Douglas appeared with reinforcements, and the English fled, crossing the Bannock Burn back to their own lines. Edward’s army moved close to the river, halting instead of crossing. But two divisions mistakenly crossed the river. At the same time, Robert de Bruce was riding in front of his men to encourage them. 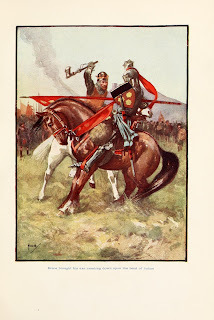 An English knight, Sir Henry de Bohun, saw the Scottish king. Putting spurs to his horse, de Bohun galloped to kill the Scottish king with his lance. Bruce’s horse was not a war-horse, and he only held a battle-axe. Robert de Bruce stood his ground, even though he could have escaped behind Scottish lines. De Bohun thundered toward him. He came closer and closer as the two armies breathlessly watched the single combat. Just as de Bohun was almost ready to spear the King, Bruce dodged and brought his axe down on the English knight’s helmet. De Bohun fell from his saddle, dead, and Robert de Bruce rode back to safety as his army cheered.